Place water, butter, 2 table spoons oil, 1 tea spoon sugar & a pinch of salt into a medium – large size sauce pan. Bring to the boil. Add plain flour and mix vigorously until well blended (the dough will come together in a minute or two). Remove from the stove and let it cool a bit. Once it is not too hot, add one egg and work the egg into the dough. Start slowly breaking the egg, then fast increasing speed, if possible. When the egg is incorporated in the dough, add another one and repeat the process. You should get dough that is not too stiff but not too soft either. If the dough is too hot, you might end up with scrambled eggs in a dough or dough that tastes like scrambled eggs so be careful. If you work the egg fast into the dough it also prevents the egg from cooking. However, this may be a bit tricky, as the dough is quite hard at this point. If you find it hard to mix with a wooden spoon, use your hands instead. Pour the vegetable/sunflower oil into a medium sized sauce pan and heat it up. Fill a piping bag (or a ziplock bag) fitted with star piping tip with half of the dough (it is easier to handle). Pipe the dough directly into the hot oil (choose any length you like) and cut with a fork (I found fork the best tool for this). Do not pipe too many churros in as they need space for frying. It will take only about 2 minutes for them to get nice golden colour and that is a sign they are ready. They should get the colour gradually. If you see they are not getting dark evenly, reduce the temperature. Serve warm with thick hot chocolate. 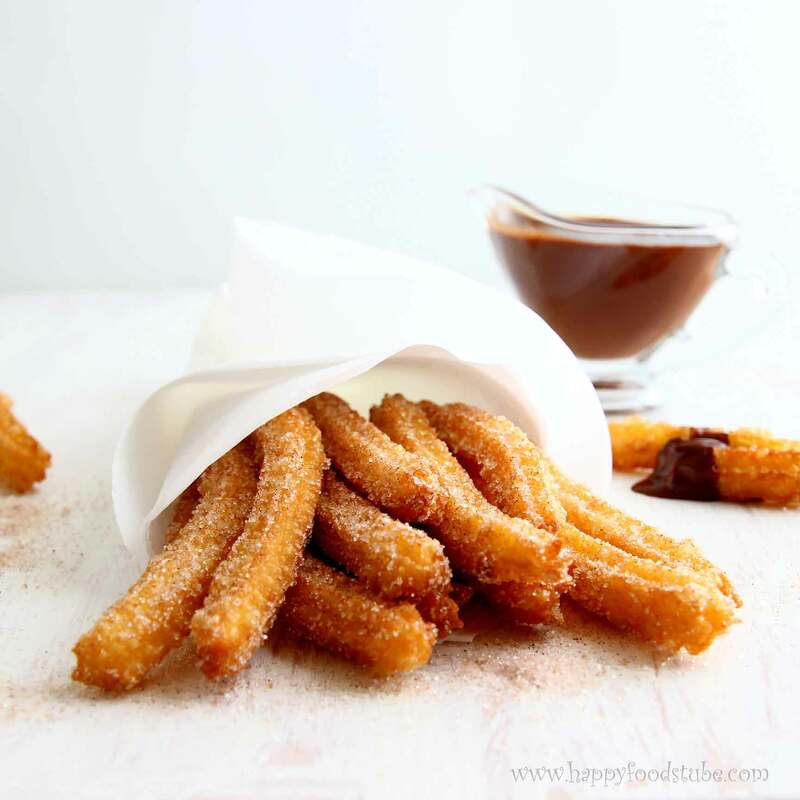 Churros are typical Spanish dessert that can be bought and enjoyed all over Spain. 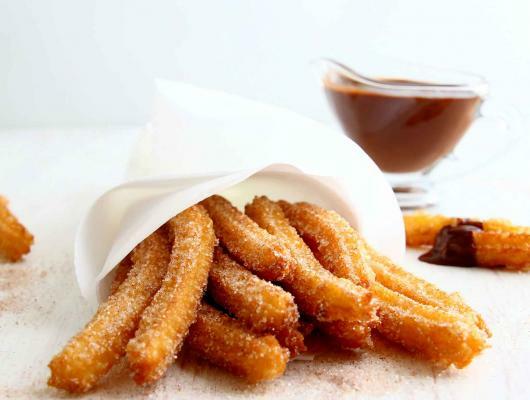 If you don’t find them in cafeterias, you’ll find stalls selling them on the streets, during fiestas or in special shops called Churrería. They are best served warm with a cup of really thick chocolate.